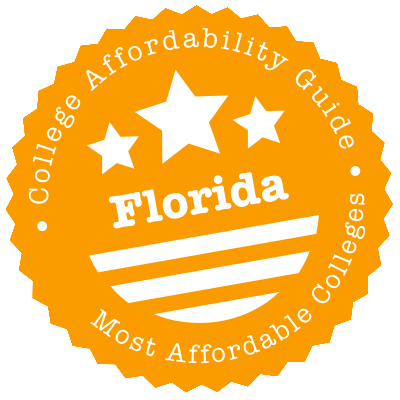 Scroll down to see our top-ranked colleges in Florida, loans and scholarships for Florida students, and advice on how to save money going to college in Florida. The New College of Florida was founded in 1960 as a public honors college, and if you're a straight-A student you'll be among your peers here - the average GPA of incoming freshmen is above 4.0. Ninety percent of New College students receive some sort of financial aid, including most admitted freshmen. Depending upon their high school GPA and test scores, freshmen can qualify for annual scholarships up to $3,500. There are also academic scholarships for National Merit Scholars and state science fair winners. Florida residents may also be eligible for a lottery-funded grant. The school's low in-state tuition rate helps; New College grads have an average college debt that's $4,000 under the average for all Florida schools. A 2,000-acre campus established in 1853, the University of Florida is the state's oldest university and home to 50,000 undergraduate and graduate students. There are 135 scholarships, grants and fellowships available to the student population of UF. Over half (54 percent) of full-time undergraduates receive need-based financial assistance. The average first-year financial aid package is $11,875. This typically consists of grants, loans and work-study options. The Machen Florida Opportunity Scholars Program supports students from economically disadvantaged backgrounds who have been admitted to the university and who are the first in their families to attend college. Recipients are given a full grant and scholarship package towards a bachelor degree. Established in 1963 and now the second largest university in the country, the University of Central Florida has more than 60,000 students from 50 states and 140 countries now calling its Orlando campus home. Incoming qualified freshmen are automatically considered for merit-based scholarships within the Pegasus Scholarship Program. Admitted non-resident students who qualify for scholarships will receive a portion of their scholarship in the form of a waiver. The value of this waiver depends on the number of credits the student takes each term and so may vary from year to year. UCF has several scholarships available for transfer students as well. All students must apply or reapply yearly for financial assistance. As a global research university, the University of South Florida offers its student population (31,000 strong as of the academic year 2014-2015) 180 degree programs at the undergraduate, graduate, doctoral and specialty levels. The USF Foundation awards over $5 million in scholarships every year. Incoming USF students with at least two more undergraduate years to go for the completion of a degree can apply for the A. Harrison and Ruth Kosove Undergraduate Scholarship. The amount of the award varies but may be enough to cover the cost of attendance at USF. The First Generation Brad and Terry Holcombe Scholarship supports USF freshmen with financial need who are the first in their family to attend college. Florida State University in Tallahassee, Florida has an eclectic list of notable alumni that includes Jim Morrison, Richard Simmons and Burt Reynolds. Almost all (95%) of full-time beginning undergraduates at FSU receive financial aid; 38% of these students receive institutional grants or scholarships. The University Freshman Scholarship provides awards of $9,600 distributed over four-years to the most outstanding freshman students. The premier undergraduate merit scholarship program at FSU is the Presidential Scholarship, which provides students with a $2,400 University Freshman Scholarship combined with an additional $2,400. The school's Tuition Reduction Scholarships provide full and partial tuition waivers to out-of-state students. Initially designated as an upper division college for juniors and seniors, the University of Northern Florida started admitting freshmen in 1984, and now has five colleges, offering 53 undergraduate degree programs and 28 graduate degree programs. The Presidential Scholarship Program is a merit-based scholarship for academically outstanding incoming freshmen. There are four award levels - Diamond ($24,000), Platinum ($16,000), Gold ($8,000) and Silver ($4,000). UNF has a First Generation Scholarship Program for students who are the first in their family to go to college. Additionally, there are a number of need-based scholarships such as the AT&T Florida Scholarship ($10,000 over four-years) and the Bank of America Community Scholarship ($8,000 over four-years). Founded in 1964, Florida Atlantic University in Boca Raton was the first public university in Southeastern Florida. FAU gives out over $154 million a year in financial aid and provides institutional grants and scholarships to 66% of full-time beginning undergraduates. The FAU Presidential Scholarship is a merit-based scholarship that provides $6,000 awards to incoming freshmen and is renewable for up to four-years. The Spirit of FAU Grant is another institutional scholarship available to incoming freshmen and it offers renewable, merit-based awards of $5,000 per year. The university also offers two institutional need-based grants: the FAU Grant and the FAU Academic Achievement Grant. Florida Gulf Coast University in Fort Myers is a relatively young institution that was founded in 1991 and held its first classes in 1997. Just over 80% of full-time beginning undergraduates receive financial aid; 17% of these students receive institutional grants or scholarships. Freshman students can apply to be National Merit Scholars, National Achievement Scholars or National Hispanic Scholars and receive $5,000 per year for up to four-years. Florida residents can also apply for the merit-based President's Gold Scholarship, which offers $5,000 per year, and the President's Silver Scholarship, which offers $3,000 per year. Non-Florida residents can apply for the Blue & Green Scholars Award, which offers $15,000 per year, and the Blue & Green Directors Award, which offers $10,000 per year. Finding a cheap college degree is always a challenge. Fortunately, Florida has a lot of strong schools that have passed our affordability test. After you’ve browsed through the info on college scholarships and tuition assistance, check if you qualify for any state financial aid packages (and be sure to fill out your Florida Financial Aid Application!). The Sunshine State has scholarships for high achievers, need-based grants for Florida residents and aid for specific minority groups. College students in Florida often find that transferring college credits is easy. Florida has a college credit transfer system that clearly maps out how students can expect to earn and transfer credits between institutions. The state offers articulation agreements, a 2+2 program with guaranteed admission, statewide course numbering, and common prerequisites. Most state universities participate in the Florida Statewide Course Numbering System. Under this system, institutions use common categorization and numbering of courses. When two institutions offer the same course, course prefix, and number, the credit will be accepted. To learn more about articulation and course transfer, visit the Florida Virtual Campus. In Florida, educational institutions also use common prerequisites. These courses make it possible to transfer lower level academic credit within the state university system. However, it is important to note that for some university degree programs, additional lower level courses may be required, and not all courses are offered at every postsecondary educational institution in Florida. With the 2+2 Florida Plan, students can rely on guaranteed admission and credit transfer. Students are required to earn an associate’s degree, and then are able to transfer lower level courses to a state university to earn a bachelor’s degree. Under this plan, students are guaranteed admission to a state university. To get the cheapest Florida college education possible, you’re probably going to have to pull together funds from lots of places—federal aid, state aid, private grants & scholarships and loans. For info on state financial aid, visit Florida’s Office of Student Financial Assistance (OSFA). It’s not the slickest of websites, but it does have a comprehensive list of state-funded scholarship and grant programs, info on student loans and sundry financial aid resources. OSFA also administers the Florida Financial Aid Application (FFAA), which—like the FAFSA—we recommend you complete. If you want to be considered for a Bright Futures Scholarship, José Martí Scholarship Challenge Grant, Rosewood Family Scholarship or Scholarships for Children and Spouses of Deceased or Disabled Veterans (see our descriptions below), you must fill out a FFAA. You can talk to an OSFA representative at 1-888-827-2004. Once you’ve explored your state options, head over to FloridaShines, a student-focused guide to earning and completing a college degree in Florida. There are resources for high school, college and returning students, as well as tools for planning a career. The section on how to Pay for College clearly explains Florida residency requirements (you must be a FL resident to qualify for in-state tuition and most state grants). Summary: ABLE grants provide undergraduate students with up to $1,500 in tuition assistance per year when they attend an eligible private Florida college or university. Students are eligible to receive an award for a maximum of 9 semesters or 14 quarters. How to Apply: Awards are distributed by schools, not OFSA, so ask for an application form from the Financial Aid Office of an eligible private Florida college or university. Summary: FGMGs are need-based grants given to Florida undergraduates enrolled in eligible Florida state universities and colleges (public community colleges). They’re intended for students whose parent/s have not earned a baccalaureate or higher degree (i.e. first generation students). How to Apply: File your FAFSA and contact the Financial Aid Office of your eligible Florida institution for info on application procedures and an application form. Your school will decide whether you qualify for an award and determine how much money you will receive. Summary: As the name would suggest, FRAGs provide tuition assistance to Florida undergraduates who agree to attend an eligible FL college or university in their home state. Each school decides how much money it wants to award a student—often around $2,000-$3,000 per year. How to Apply: Each school has its own application procedures, deadlines and eligibility requirements. Ask the Financial Aid Office of your eligible FL college or university for an application form. Florida Public Student Assistance Grants are available to students attending Florida state universities and public community colleges. Florida Private Student Assistance Grants are available to students attending eligible private, non-profit, four-year colleges and universities. Florida Postsecondary Student Assistance Grants are available to students attending eligible degree-granting private colleges and universities not eligible under the Florida Private Student Assistance Grant. Florida Public Postsecondary Career Education Student Assistance Grants are available to students attending eligible and participating Florida colleges (public community colleges) or career centers operated by district school boards. Students who want to enroll for three-quarter-time in a FSAG Public program must complete 9-11 credit hours per term. Students who want to enroll for half-time in a FSAG Public program must complete 6-8 credit hours per term. How to Apply: Each school has its own application procedures and eligibility requirements, but you will definitely need to file your FAFSA so the institution can determine your financial need. Contact the Financial Aid Office of your eligible college or university for more information. Florida Academic Scholars (FAS) have completed required high school credits, achieved a minimum 3.50 GPA, scored a minimum of 29 (ACT) or 1290 (SAT) and logged 100 service hours. Florida Medallion Scholars (FMS) have completed required high school credits, achieved a minimum 3.00 GPA, scored a minimum of 26 (ACT) or 1170 (SAT) and logged 75 service hours. Gold Seal Vocational Scholars (GSV) have completed at least 3 credits in a single Career & Technical Education program, achieved a minimum 3.00 GPA for non-elective high school courses and 3.50 GPA in career education courses, scored certain minimums on an ACT, SAT or PERT exam and logged 30 service hours. Award amounts vary widely depending on what kind of scholarship you receive, but FAS recipients can receive up to $103 per credit hour. These awards are renewable as long as you maintain a certain college GPA and credit hours. Check with the website for exact details. However, there are lots of specific requirements and exceptions (e.g. homeschooling, GED) for each kind of scholarship, so we recommend you check the website for precise details on eligibility. How to Apply: You’ll need to complete your Florida Financial Aid Application (FFAA) after December 1 of your senior year and no later than August 31 after high school graduation. Once you’ve submitted your FFAA, you can track your application status online. Summary: These generous scholarship are given to Florida high school graduates who receive recognition as National Merit or National Achievement Scholars. The award is equal to the institutional cost of attendance (e.g. tuition, fees, room & board, books, supplies, etc.) minus any money you receive from Bright Futures and the National Merit/Achievement award—basically, it pays for college! How to Apply: You don’t need to complete a separate application form. The National Merit Scholarship Corporation will send you a letter asking you to choose an eligible Florida institution. Undergraduate Scholarship: Students must earn a minimum GPA of 3.0 based on subjects credible towards a high school diploma. Graduate Scholarship: Students must earn a 3.0 college GPA for undergraduate work. For either type of scholarship, you must also attain the required GPA. How to Apply: Along with filing your FAFSA, you’ll need to complete your Florida Financial Aid Application (FFAA) by April 1 at the latest. Get your FFAA done early(! )—applicants can be ranked by submission date. Prospective undergraduate students should apply during senior year of high school and ensure their high school principal certifies their 7th semester GPA to OSFA. Prospective graduate students should ensure that an admissions official at their prospective graduate school certifies their college GPA to OSFA. Summary: The MMB is a need-based and merit-based scholarship given to students who wish to attend one of the following participating institutions: Bethune-Cookman University, Edward Waters College, Florida A&M University or Florida Memorial University. The annual award amount is $3,000 per year. How to Apply: Each school has its own application procedures, deadlines and eligibility requirements. Ask the Financial Aid Office of a participating institution for an application form. Summary: MTES is a merit-scholarship given to aspiring African-American, Hispanic-American, Asian-American and Native American teachers. Provided they’re enrolled in an approved teacher education program, students can receive $8,000 for 4 semesters of undergraduate study or $12,000 for 6 semesters of programs requiring 5 years to receive certification. Award recipients must agree to teach one year in a Florida public school for each year the scholarship is received. How to Apply: Fill out the application form on the FFMT.org website. Deadlines: July 1 for the fall semester; November 1 for the spring semester. Summary: The Rosewood Family Scholarship can only be given to direct descendants of Rosewood families affected by the destruction of Rosewood in January 1923. A maximum of 50 eligible students will receive financial assistance to attend a state university, public community college or public postsecondary vocational-technical school. How to Apply: You will need to 1) File your FAFSA. 2) Complete your Florida Financial Aid Application (FFAA) by April 1 at the latest. 3) Mail copies of your ancestry documents to the address listed in the FFAA application. Summary: The JRJ loan repayment assistance program gives financial support to state and federal public defenders and state prosecutors. Although funds for this program are allocated from the Bureau of Justice Assistance, loan repayments are awarded and administered by designated state agencies. Eligibility: Applicants must be currently employed full-time as an eligible prosecutor or public defender, have eligible student loan debt and sign a service agreement to stay in their job for at least 3 years. How to Apply: Visit the OSFA website for an application form, service agreement and answers to FAQs. Summary: To tackle of a shortage of qualified nurses in certain areas of the state, the Florida legislature has set aside certain funds for loan forgiveness. Eligible nurses can receive loan repayments of up to $4,000 per year for a maximum of four years. These awards are based on available state funding. How to Apply: Visit the OSFA website for an application packet, list of designated sites and answers to FAQs. Summary: Florida provides state tuition assistance for Florida National Guard Soldiers and Airmen for the period of service. EDD will pay up to 100% of public tuition and fees (or private tuition at the average Florida state school public tuition rate) at eligible schools. How to Apply: You can download an application form and find answers to FAQs on the DMA website. Summary: As the title implies, these scholarships are available to dependents of deceased or permanently disabled Florida veterans. That includes children with a parent who has been deemed a POW or MIA, or has been captured while working in a civilian role for the U.S. government during wartime. Scholarships can be used to pay for tuition and fees at eligible postsecondary institutions. Students may be able to receive funding for up to 110% of the number of the required credit hours. Enroll in an undergraduate or certificate program for a minimum of 6 credit hours. How to Apply: You will need to 1) File your FAFSA. 2) Complete your Florida Financial Aid Application (FFAA) by April 1 at the latest. Summary: The state is willing to waive tuition & fees at public community colleges and state universities for recipients of the Purple Heart (or other combat decorations superior in precedence). Students may be able to receive funding for up to 110% of the number of the required credit hours. How to Apply: Talk to the Financial Aid Office at your chosen community college or university for details on how to apply for a waiver. You’ll need to submit evidence of FL residency and a DD-214 to the school to prove that you have received a Purple Heart or other combat decoration superior in precedence. More questions? Contact the Florida Department of Veterans’ Affairs for advice and guidance on returning to college. Summary: FWEP is a need-based award targeted at Florida students who want to complete work experiences that complement their career and educational goals. A variety of colleges, universities, community colleges, career centers and educator preparation institutes participate in the program. Award amounts vary depending on the school. How to Apply: You will need to file your FAFSA so the institution can determine your financial need. Each school has its own application procedures and eligibility requirements (e.g. number of hours to be worked per week), so contact the Financial Aid Office of your eligible school for more information. Summary: If you’re a foster youth or former foster youth who has been through the DCF system, you may be exempt from paying tuition and fees for a workforce education program, an institution within the Florida College System or a state university! Under 18 and currently in the custody of a relative pursuant to § 39.5085, Fla. Stat. Over 18 and was in the custody of a relative on the 18th birthday pursuant to § 39.5085, Fla. Stat. Over 18 and was in the custody of a non-relative on the 18th birthday pursuant to § 39.5085, Fla. Stat. How to Apply: Contact your local community-based DCF agency to see if you qualify and to get more information on the process. Going to college can put a huge strain on the family budget. If you find yourself struggling to afford basic services like heat, rent and food, the state government may be able to help. For info on food stamps, homelessness and temporary cash assistance, check out the website of the Florida Department of Children & Families (DCF). Here you can apply online for benefits or search for other services and programs (e.g. LIHEAP, discount drug program, refugee assistance, etc.). Can’t afford to pay for a bill? Don’t know how to take care of a sick parent? Worried about finding cheap child care? Call 2-1-1 (toll-free) or visit the Florida 211 website. 2-1-1 is a free and confidential service that links Florida residents with organizations and services in their area. 2-1-1 staff can offer qualified advice and steps on how to move forward. We’ve also listed a number of county-specific social service organizations in our city sections below. Depending on your location, on-campus living may be a viable financial option. You’re saving on commuting costs, rooms are usually furnished, utilities are included in the room rate and buildings are well-insulated. Plus you have options. For example, UF has built villages for graduates & families and FGCU has affordable furnished apartments in its North Lake Village. In some cases, you may have no choice—for example, UNF requires all incoming freshmen to live on campus.Room rates will be listed on university housing websites, along with any extra costs for meal plans. To get a sense of what you’ll really have to pay, use a budget calculator on MappingYourFuture.org or CalcXML.com to compare on-campus costs (meal plans, dorm fees, etc.) with off-campus bills (groceries, utilities, etc.). When in doubt, ask for advice. Since many financial aid packages don’t cover housing costs, you may also want to talk to your school’s residential life/housing coordinator or the Financial Aid Office. You could be eligible for private scholarships or work-study programs that will pay for room and board. If you’re attending a commuter school like Valencia and Chipola—colleges that don’t offer any housing—you have the choice to live at home or find affordable off-campus housing. Even in schools with extensive on-campus housing, you may take one look at the prices for some university dorm rooms and decide to head for the hills. All the big players (UF, FSU, USF, UCF, etc.) have separate websites devoted to off-campus living, complete with extensive rental listings. Smaller schools may not have as many resources, but they’re always happy to provide advice. Valencia holds annual housing fairs on campus and provides rental information and roommate listings through the Student Development office. Planning to share housing with friends? In addition to browsing Craigslist for cheap apartments, you can also try websites that allow you to target your school. Examples of these include MyApartmentMap.com, CampusRent.com and ApartmentGuide.com. In times of crisis or homelessness, the Florida Homeless Shelter Directory lists emergency shelters and transitional housing opportunities. Utility payments can be a real budget-breaker for new students. Always ask your landlord what utilities are included in your monthly rent before you sign any Florida rental agreement. You need to know if you’re going to be paying for basics like water and heat. You’re perfectly within your rights to request a monthly estimate of utility bills. Are you already living in Florida (e.g. at home) and having trouble paying for utilities? Florida’s LIHEAP program is a government program that’s designed to help low-income families with home heating and cooling costs. What’s more, the Florida Power & Light Company (FPL) offers Care to Share and ASSIST programs for low-income customers who are unable to pay their electric bill. Your county government website and the Florida 211 website can connect you to local programs in your area. Almost every major college and university in Florida runs a health center for students—the bigger the school, the more extensive the services. For example, the doctors and nurses (and others) at UF’s Student Health Care Center offer general medical care, nutrition services, physical therapy, radiology services and much more. FSU’s University Health Center has a variety of clinics (Women’s Health, Travel, Psychiatry, etc.) and runs a 24-hour healthcare hotline. If your Florida college doesn’t have a health center or you need help for your larger family, visit NeedyMeds.org and FreeClinicDirectory.org to find community clinics and health centers in your city that offer free or affordable medical care. Student parents should also know that Florida KidCare offers free or discount health insurance to children up to the age of 18. The same general procedure goes for mental health crises. Visit your student health center first, then search the DCF website to find local mental health services/programs in your Florida county. The Mental Health Crisis/Suicide hotline is 1-800-273-8255. Having trouble with your teeth? Ask if your school offers dental services—for example, UCF has its own Dental Center. When that option fails, see if you live near a university dental school. Because these schools are training new dentists, they often offer discount care to any patient. For example, fees at UF’s DMD Student Dental Clinic are generally 30%-50% less than private practice. You can also search the list on FreeDentalCare.us:Florida for free and low-cost clinics in your community. A good chunk of affordable Florida colleges and universities in our rankings provide on-campus child care, including Florida International University, Florida State University and the University of Florida. One thing to note—competition for these spots can be fierce, so it’s always best to apply as soon as possible. Nothing on your campus? The DCF has a Child Care Provider Search where you can search by type (e.g. after school, daycare, etc.) and location. Remember, too, that you might qualify for the Florida School Readiness Program, which offers financial assistance to low-income families (including college students) for early child education and care. For more help, you can talk to someone at Community Coordinate Care for Children (4C). This non-profit organization offers for free childcare resources and referral services. Car, bus, bike, foot—whatever your choice of transport to a Florida college, take a quick look at your university’s transportation or parking website. Along with information on cheap carpooling, ride-sharing, parking facilities, bike rentals and more, the website will have links to student discounts and passes (e.g. low fares on city buses) in the area. Big Florida schools run their own free transport networks on campus. For example, USF operates a bus system (the Bull Runner); FSU manages the Seminole Express Bus Service; and UCF has shuttle services for on-campus locations, off-campus properties and grocery stores/supermarkets. UF students can even ride Gainesville’s Regional Transit System (RTS) for free. Please don’t go hungry in order to afford college! More and more Florida schools—especially public universities and community colleges—are opening food pantries on-campus. For example, you’ll find food banks at FSU, UF, UCF, FIU and UNF (just to name a few). FAU’s Beyond Food Program goes one step further to offer assistance with other problems (e.g. academic difficulty or domestic violence). Check your university’s website for more info. If your school can’t help you, your local neighborhood can. FoodPantries.org has a long list of Florida Food Pantries and HomelessShelterDirectory.org has a similar database of FL soup kitchens, pantries and food banks. Are you a new mom or mom-to-be? You may qualify for the Florida WIC Program, which offers healthy foods to low-income families with infants. Compared to Miami, Jacksonville is a relatively affordable place to live. According to Sperling’s Best Places, overall housing costs are significantly below the national average. However, since Jacksonville is the largest city (by area) in the continental U.S., you’ll find rents vary widely depending on the neighborhood. Public transport is weak, so student commuters will also need to think about vehicle costs. General info for residents can be found on the City of Jacksonville website. Do you already live in Jacksonville? Struggling to find cheap housing for you and your family? Wondering if college is the right path or need a job to help make university more affordable? Some of these non-profit organizations may be able to help. The Sulzbacher Center is the largest provider of homeless services (for men, women and children) in Northeast Florida. The center supplies free meals, safe shelters, affordable housing, healthcare programs and career support. In 2012, the center teamed up with Florida State College to offer a “Pathways to College – High School Equivalency Program” for 20 Sulzbacher residents a semester. The AnnieRuth Foundation was created to support families in underserved communities in Jacksonville. It offers a free summer internship program for high school juniors and seniors, runs parenting skills workshops and hosts regular community parties. At Project SOS (Midtown Center), you have the option to talk to a life coach about your career goals and education challenges. Project SOS also runs youth development workshops in schools and posts free resources and tips for parents. Fresh Ministries is an interdenominational organization that has a large number of programs, including the LifePoint Career Institute (job training and placement for unemployed adults), Fresh Futures (job and college readiness training for Duval County high-school students) and Fresh Path (mentoring and tutoring for youth offenders). For more assistance, you can call 2-1-1 or search by category (e.g. education, food, etc.) in the directory of Jackonsville, FL non-profits on CharityBlossom.org. Finding a cheap apartment in a safe Miami neighborhood is going to require some searching. Sperling’s Best Places puts the cost of housing way above Tampa or Jacksonville. You’ll probably also be paying more for groceries. If you don’t have a car, look for affordable housing near the Metrorail or within walking/biking distance of campus. General information for residents can be found on the City of Miami website. If you’re looking for affordable Miami colleges, you probably already have other important commitments—family responsibilities, multiple jobs, mortgage or rent payments, etc. When you feel overwhelmed, these Miami non-profits can lend a helping hand. Miami-Dade Community Service Centers are located through Miami-Dade County and offer all kinds of programs—emergency food & shelter, ESOL classes, farm share, food & clothing distribution, immigration assistance—you name it. Miami Bridge Youth & Family Services, Inc. is a 24-hour emergency shelter that provides refuge, protection and on-site education programs (including GED programs) to youth in crisis. Educate Tomorrow was built to serve Miami-Dade County’s foster care youth and students in need. It teams up with community partners to offer skill-building workshops, college planning and mentoring, GED completion and life coaching. Neat Stuff provides free, brand-new clothes, shoes, books and toys to families who are at or below the poverty line. For more assistance, you can call 2-1-1 or search for helpful Miami non-profits on the Miami Foundation website. You can also search by category (e.g. education, food, etc.) in the directory of Miami, FL non-profits on CharityBlossom.org. Overall, Tampa is a fairly cheap city. Data from Sperling’s Best Places put almost every cost of living category under the national average. On the other hand, transportation costs can be high. And be prepared for hurricane clauses in your renters insurance. General information for residents can be found on the City of Tampa website. No matter where you are in your education, you may already be juggling family commitments, draining jobs, less than cheap rents and expensive car payments. Here are some local community organizations that can help make day-to-day life a little more manageable. Housing and Education Alliance provides bilingual housing counseling services, including foreclosure prevention. It also manages the Esperanza Project, an apartment-style complex with affordable housing. University Area Community Development Corporation (CDC) supplies youth programs, adult education classes, healthcare assistance, advice and resources to families in the University Area Community. Feeding Tampa Bay runs mobile food pantries, children’s food programs and disaster relief efforts. SNAP outreach coordinators also help folks apply for government food assistance. Wheels of Success helps low-income families obtain reliable vehicles through a program of vehicle replacement, car payments & down-payments, car repairs, licensing services and car-care classes in Hillsborough, Pinellas and Pasco counties. For more assistance, you can call 2-1-1 or search by category (e.g. education, food, etc.) in the directory of Tampa, FL non-profits on CharityBlossom.org.